Would you believe that March and April, historically, shows a 2 to 1 statistical probability of NG moving higher. Each of these months shows, historically, that NG has a strong potential for at least a $1.00 upside price move in both March and April. Only 1/3 of the historically testing time (23 years) did the price of NG actually decrease. How do we know this? We've built proprietary price modeling and data modeling solutions that allow us to isolate and verify this data. This data was tested on a Monthly price basis for the statistics we've provided, above. When we run this same test on Weekly data, the results continue to support our conclusions. 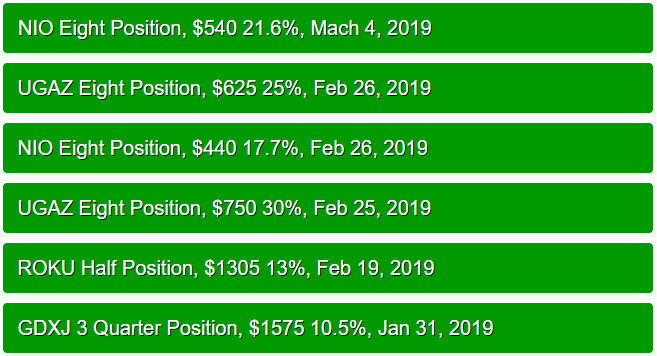 The weekly historical data analysis for March shows a 53 to 46 positive price advantage with an average of $0.99 upside advantage over 99 tested weeks. The weekly historical data analysis for April shows a 58 to 45 positive price advantage with an average of $0.89 upside advantage over 103 tested weeks. Although the Weekly data is not as overwhelming in terms of positive to negative weekly results, the overall results still support the Monthly data – resulting in nearly a $1.00 upside price advantage. Therefore, we believe any price rotation down in Natural Gas near recent lows, below $2.70, would be an excellent opportunity to take long positions with an upside target between $3.10 and $3.35. We are not attempting to target the full $1.00 potential upside because we want to target safer, quicker upside objectives – not the lower probability targets. In doing so, targeting a $0.40 to 0.60+ range allows us to execute very high probability objectives and trade almost like a “sniper”. Get in, get our target and GET OUT. If you want to see recent trade we closed on natural gas take a look at this post which I think you will agree is nothing short of simple and awesome! 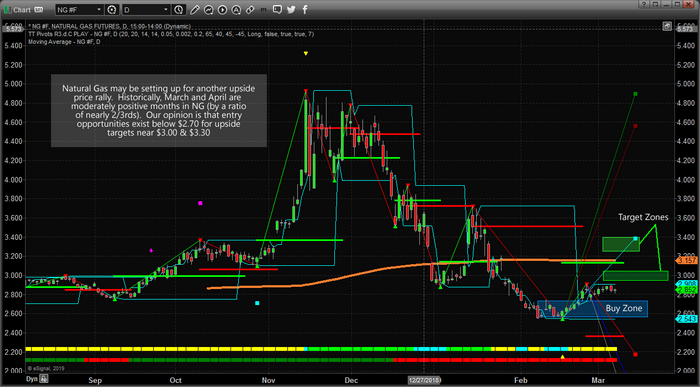 We believe the current Buy Zone in NG is below $2.70. Once price rotates a bit lower, any entry near the $2.70 level or lower would be an excellent entry level for skilled traders. Our targets would be anything north of $3.00. Ideally, we would pull half of our trade-off as soon as the price reached above $3.00 and pull the second half off when prices reached above $3.20 or $3.25. Remember, we're showing you that the months of March and April share this upside price advantage. This means there is a higher probability of upside price moves throughout March & April in NG and all we have to do is find the strategic entry points and “run our trades”. Get ready for some great trading opportunities this year and pay attention to NG. Remember, you can trade the ETFs for Natural Gas as well.